Not really a game – but more like a global invitation to be creative and play. 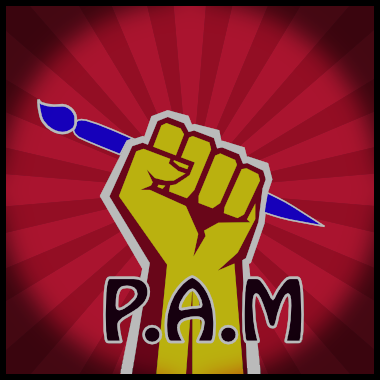 P.A.M or the People’s Art Month is a concept for a month long celebration of indulging in artistic pursuits. It is permission for anyone to call themselves an artist and complete a piece of visual fine art (excluding written or musical art) that expresses an idea – in a month. Hopefully it would have a similar effect as Nanowrimo and encourage people to have the confidence to be artists and increase appreciation of artistic pursuits. We would work with galleries and museums to encourage them to accept submissions from P.A.M participants on a special day at the end of the month, which also gets people into the museums.